Do you get excited when you’re able to save money? If so, you’ll want to check out the best coupon apps to use at Safeway. Stacking coupons with cash-back rebates often times yields the highest percentage of savings. Plus, the offers are pretty fantastic – such as freebies, produce, grocery, home care, personal care, and more. Most of the apps listed can be combined with manufacturer’s coupons and other cash-back rebates, unless otherwise stated. Are you ready to start saving the big bucks? Check out the cash-back rebates apps listed below to get started. 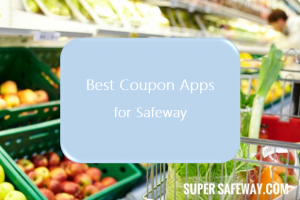 Safeway Just for U– Regarding saving money, the Safeway Just for U app offers personalized savings, manufacturer’s coupon, and you can view your club specials. Additionally, you can check your gas rewards, find your nearest store, locate a product by aisle, and much more. ibotta – This is an amazing cash-back app out of Denver. It’s my all-time favorite rebate app, as it as allows you to combine deals with manufacturer’s coupons and other rebate apps. Plus, there are several any brand deals, which is fabulous if you’re a fellow produce lover. mobiSave – The mobiSave app is fantastic! They offer great savings on several brands, it’s really simple to use, and a great option. Another terrific thing about mobiSave, each week they offer a diverse selection of any brand rebates. Make sure to read the rebate details, some offers you cannot combine with manufacturer’s coupons or other cash-back rebate apps. Checkout51 – This cash-back app is fantastic, offering several rebates from several manufacturers. Additionally, they offer a “pick your own” rebate each week on produce. Added bonus! SavingStar – Is a great cash-back rebate app that offers all sorts of deals. You’ll find a weekly freebie, a rebate for 20% the selected produce of the week, and a whole bunch of manufacturers. Please note, you CANNOT use SavingStar WITH a manufacturer’s coupon OR other cash-back rebates. Shrink – Is a great rebate app that offers deals on healthier options. You can earn both cash and points for various brands. Additionally, they have a couple of any brand offers, which is awesome. Make sure to read the rebate details, some offers you cannot combine with manufacturer’s coupons or other cash-back rebate apps. BerryCart – This great cash-back app offers rebates on healthier options, such as organic and vegan products. Shopmium – The Shopmium cash-back rebate app is a great way to save money on products you already buy.